What are 2 and 20 (Hedge Fund Fees)? The 2 and 20 is a hedge fund compensation structure consisting of a management fee and a performance fee. 2% represents the management fee (flat rate fee) of the total assets under management, and the 20% represents the performance fee charged on the value of profitsCapital Gains YieldCapital gains yield (CGY) is the price appreciation on an investment or a security expressed as a percentage. Because the calculation of Capital Gain Yield involves the market price of a security over time, it can be used to analyze the fluctuation in the market price of a security. See calculation and example that the hedge fund generates for its investors beyond a certain profit threshold. The 2% fee is charged on the assets under managementMarketable SecuritiesMarketable securities are unrestricted short-term financial instruments that are issued either for equity securities or for debt securities of a publicly listed company. The issuing company creates these instruments for the express purpose of raising funds to further finance business activities and expansion. regardless of the performance of the investments under the fund manager’sPortfolio ManagerPortfolio managers manage investment portfolios using a six-step portfolio management process. Learn exactly what does a portfolio manager do in this guide. Portfolio managers are professionals who manage investment portfolios, with the goal of achieving their clients’ investment objectives. pool. However, the 20% fee is only charged when the fund achieves a certain level of profits or performance. 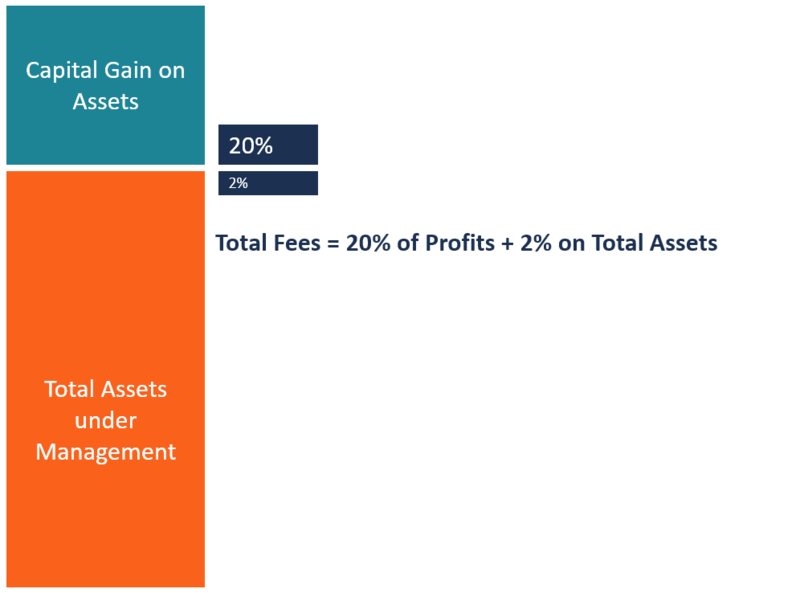 The 2 and 20 fee structure helps hedge funds finance their operations. The 2% flat rate charged on the total assets under management is used to pay staff salaries, administrative and office expensesSG&ASG&A includes all non-production expenses incurred by a company in any given period. This includes expenses such as rent, advertising, marketing, accounting, litigation, travel, meals, management salaries, bonuses, and more. On occasion, it may also include depreciation expense and keep the fund running. The fund holds the remaining 20%, from which the hedge funds reward its executives, portfolio managers, and other staff members with bonuses for impressive performance. This bonus structure what leads hedge fund managers to be some of the highest paid people in the world. The 20% performance fee is the biggest source of income for hedge funds. However, the performance fee is charged depending on the performance levels that the fund manager has agreed with the investor. Most agreements will set a return of 8%. It means that the hedge fund will only charge a fee if the profits for the year surpass the 8% level. For example, if the fund earns a return of 15% during a specific year, then the 20% performance fee will be charged on the incremental 7% profit, (i.e., 15% – 8%). Assuming the hedge fund manages the assets of 10 large investors and they all return a substantial profit, the hedge fund could earn a considerable income running into millions, and sometimes, billions of dollars. While some investors consider this hedge fund fee structure too high, some hedge funds have maintained this compensation structure over the years. Some of these hedge funds have had impressive returns for their investors and their clients are always willing to stay with them even with the high fees. An example of a hedge fund manager that has kept this fee is Renaissance Technologies, which is led by Jim Simmons. The company maintained an average return of 71.8% between 1994 and 2015, with a gain of 21% as its worst performance during the period. Due to its high yields on the investors’ funds, the company sometimes charged a 44% performance fee and the clients were willing to remain with the hedge fund firm. Both investors and politicians have put hedge funds under pressure for their 2 and 20 compensation structure. From the investor’s point of view, most hedge funds have been underperforming and mostly having inconsistent performance. For example, investors who have earned low or zero returns on their investments may feel overcharged when they are charged the 2% management fees, yet the fund has been underperforming. As a result, a huge number of investors have been redeeming their assets being managed by poorly performing funds and transferring these investments to large hedge funds that charge lower fees and have a positive track record. From the politician’s point of view, the 2 and 20 compensation structure results in high profits, and as such, these profits should be classified as ordinary income for tax purposes. As it is, hedge fund profits are classified as capital gains, which are taxed more favorably than regular incomes. Hedge funds have protested such an arrangement since their income is based on performance and is not a salary that is paid every year. Due to pressure from politicians and investors, most hedge funds have reduced their fees structure to suit their diverse clients. However, some hedge funds have maintained the 2 and 20 structure due to their high levels of returns. A large proportion of hedge funds have adopted a hurdle rate that requires that the fund manager attains a certain minimum net return before charging performance fees. Hurdle rate refers to the minimum rate of return that a fund manager should generate before charging performance fees. In most cases, the hurdle rate is tied to the S&P 500S&P - Standard and Poor'sStandard and Poor's (S&P) is a market leader in the provision of benchmarks and investible indices, as well as credit ratings for companies and countries, and other financial information services.. For example, if the fund sets a hurdle rate of 7% and the fund returns 15%, the fund manager will charge the performance fees on the increment above the 7%. Startup and emerging hedge funds offer incentives to interested investors during the early stages of their business. These incentives are known as “founders shares,” where the fund gives the first clients an attractive offer like 1.5 and 10. Another option is to use the 2 and 20 fee structure but with a promise to reduce the fee when the fund reaches a specific milestone. Such an offer compensates the investors for the risk of investing in a hedge fund with a zero track record. A hedge fund may decide to offer a substantial discount to investors who are willing to lock up their investments with the company for a long period, such as 5 years, 7 years or 10 years. It is most common with hedge funds that require longer illiquidity to generate meaningful returns for their clients. In exchange for the longer lockup period, the clients benefit from a reduced fee structure. Most hedge funds include a watermark clause that states that a hedge fund manager can only charge performance fees after the fund has generated new profits. Additionally, if the fund incurs losses, it must recover the losses before charging performance fees. Exchange Traded Funds (ETFs)Exchange Traded Fund (ETF)An Exchange Traded Fund (ETF) is a popular investment vehicle where portfolios can be more flexible and diversified across a broad range of all the available asset classes. Learn about various types of ETFs by reading this guide.